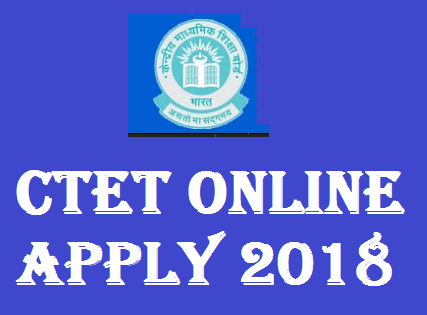 The Central Board of Secondary Education (CBSE) is already starting the online registration for its Central Teacher Eligibility Test (CTET) 2018 from 1 st August on its official site ctet.nic.in and 27 August is the last date to submit the online application. The Examination fees can be paid up to August 30. The examination will be held in 20 languages in 92 cities everywhere throughout the nation. The examination date hasn’t released yet and the correct date and month for conducting the exam will be told on the official site www.ctet.nic.in. Prior, the procedure was booked to begin from Jun22 yet, it was postponed because of some official reasons. The examination will be held for a person to be qualified for selection as a Teacher for Class 1 to 8. An applicant who will get a score of at least 60% in the exam will be considered as TET pass. The SC/ST/OBC/differently category will be given relaxation up to 5%. Stage 2: Go to the link for "Apply Online" and Click. Stage 3: Fill correctly the Online Application Form and note down Registration No. or Application No. Stage 4: Upload Scanned Images of most recent Photograph and Signature with given size. Stage 5: Pay Examination Fee by e-challan or Net Banking. Stage 6: Take a Print of confirmation page for future reference. The Exam Fee payment through Debit Card, Credit Card, Net Banking and e-Challan. Note: Before applying or correctness of notification, please visit the official website and read official notification.